Draft: 2010, Baltimore Orioles, 9th rd. Parker Alan Bridwell was originally signed by Orioles scout Ernie Jacobs…is married, Molly…attended Hereford HS (TX). Combined to pitch in just 11 games with Los Angeles (AL) and Triple-A Salt Lake…missed four months of the season due to two stints on the Bees disabled list with an inflamed right elbow… went 1-0 with a 17.55 ERA and .438 opponents batting average in five games, including one start, over two stints with the Angels…surrendered five home runs in 6.2 innings…his opponents batting average broke down to .417 (5-for-12) against left-handed hitters compared to .450 (9-for-20) against right-handers…yielded a .583 average and four of his five home runs with two outs…first batters faced were 2-for-4 and he did not inherit a runner in his four relief appearances…was optioned to Salt Lake near the end of Spring Training but was recalled by Los Angeles April 3 before the Bees season began…started against Oakland on April 6 and had a no decision in the Angels 13-9 win…allowed six runs on seven hits in 1.2 innings, which was the shortest outing of his career as a starter…was optioned to Salt Lake the next day…returned to Los Angeles on Sept. 11 and had a win and a 12.60 ERA in four relief appearances…did not allow a run in two of his appearances but surrendered at least three in his other two…the win came in his final outing of the season on Sept. 30 against Oakland…three of his five outings came against the A's and all five came against AL West competition…was claimed off waivers three times during the off-season by New York (AL) on Nov. 26, the Angels on Dec. 21 and the A's on Jan. 22. SALT LAKE: Spent the balance of the season at Salt Lake where he was 1-1 with an 8.68 ERA and .391 opponents batting average in six starts…yielded a .347 (17-for-49) average against lefthanded hitters compared to .418 (33-for-79) against right-handers…surrendered all four of his home runs to righties…opponents hit .404 with runners in scoring position but that dropped to .083 with RISP and two outs…joined Salt Lake on April 11 and had no decisions and a 9.31 ERA in two starts before he was placed on the disabled list April 19 with an inflamed right elbow… was reinstated from the DL May 18 and went 1-1 with a 8.35 ERA in four starts before returning to the DL with the same injury June 8…missed the remainder of the Bees season but was reinstated from the DL Sept. 11 and moved up to Los Angeles…yielded a season-high eight runs on a season-high 11 hits April 16 at Albuquerque…allowed at least five runs in four of his six starts and seven hits five times. Entered season ranked by Baseball America as #21 prospect in Orioles organization ... Made first two appearances (both in relief) for Triple-A Norfolk and allowed eight earned runs in four innings ... Acquired by Angels Apr. 17 from Baltimore in exchange for cash considerations or a PTBNL ... Pitched in two games with Double-A Mobile, before being promoted to Triple-A Salt Lake May 9 ... Earned win in Angels debut (first start of career), May 30 vs. Atlanta (6 IP, 6 H, 3 ER, 1 BB, 4 SO) ... Led American League rookies with 10 wins ... Angels went 17-3 in his starts, marking best team record in a rookie's starts since 1944 St. Louis Cardinals went 18-3 in Ted Wilks' starts ... Angels were 9-0 in his road starts…Nine straight road wins to begin a career are tied with Brooklyn Dodgers' Clem Labine for second longest streak all-time...Only player with a longer streak is Hall of Famer Whitey Ford; Yankees won each of his fi rst 13 road starts from 1950-53 ... Did not allow an opposing baserunner to steal a base…Streak of 20 consecutive starts without a stolen base allowed sets Club record to start an Angels career (previous was Tommy John - 18 starts in 1982-83) ... From start of July through Aug. 25, went 5-1 with a 2.38 ERA (56.2 IP - 15 ER) across nine starts with 38 strikeouts and 11 walks…His ERA ranked fourth in the American League in that span...In four July starts, went 3-0 with a 1.69 ERA (26.2 IP - 5 ER)…Became third Angels rookie to finish July with an ERA below 1.75 (min. 25 IP), joining Bob Lee (0.76 ERA in 1964) and Jered Weaver (1.65 ERA in 2006). Enters 2016 ranked as the No. 22 prospect and No. 21 prospect in Baltimore's organization by Baseball America and MLB.com, respectively. ... Added to the Orioles 40-man roster on 11/20 • Spent the season with Double-A Bowie and recorded a season-high nine strikeouts three times (4/11 at Richmond, 5/19 at Trenton, and 7/1 at Akron). ... Led the Baysox in strikeouts (93). ... Tossed a complete game (8.0 IP) on 6/18 at New Britain but suffered the loss. ... Rated by Baseball America as having the best changeup in the Eastern League. ... Placed on the 7-day disabled list with elbow tendinitis on 8/1. Named an Arizona Fall League All-Star...Logged a club-high 11 Quality Starts with Class A-Advanced Frederick... Finished second in the Carolina League in strikeouts (142), fourth in games started (26), fifth in batting average against (.234) and innings pitched (141.2), and second among starting pitchers in strikeout/9.0 IP ratio (9.0 K/9.0 IP)...Named Carolina League Pitcher of the Week for 5/12-18 after coming two outs shy of a no-hitter against Potomac on 5/13...Posted a 2.72 ERA over six starts in May and a 2.51 mark over five games in June...Put together seven straight Quality Starts at home, 5/13-6/27...Struck out a season-high 13 over 8.0 scoreless frames on 8/25. Finished second in the South Atlantic League with 144 strikeouts, the most by a Shorebirds pitcher since 2009...Led the SAL in innings pitched (142.2)...Named SAL Pitcher of the Week, 8/12-18. nings pitched (142.2)...Named SAL Pitcher of the Week, 8/12-18. 2012: Finished tied for the Class A Delmarva lead in innings pitched (114.1) and games started (22)...Pitched a one-hit complete game on 7/21 at West Virginia. Named the Orioles fourth-best prospect after the season by Baseball America...Led Short-Season Aberdeen in games started (11), innings pitched (53.2), and strikeouts (57)...Finished the year 2-5 with a 4.53 ERA (27 ER/53.2 IP). April 5, 2019 Las Vegas Aviators released RHP Parker Bridwell. January 25, 2019 Oakland Athletics sent RHP Parker Bridwell outright to Las Vegas Aviators. 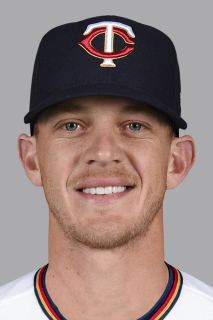 January 25, 2019 Oakland Athletics invited non-roster RHP Parker Bridwell to spring training. January 22, 2019 Oakland Athletics claimed RHP Parker Bridwell off waivers from Los Angeles Angels. January 15, 2019 Los Angeles Angels designated RHP Parker Bridwell for assignment. December 21, 2018 Los Angeles Angels claimed RHP Parker Bridwell off waivers from New York Yankees. December 17, 2018 New York Yankees designated RHP Parker Bridwell for assignment. November 26, 2018 New York Yankees claimed RHP Parker Bridwell off waivers from Los Angeles Angels. November 20, 2018 Los Angeles Angels designated RHP Parker Bridwell for assignment. September 11, 2018 Los Angeles Angels recalled RHP Parker Bridwell from Salt Lake Bees. June 10, 2018 Salt Lake Bees placed RHP Parker Bridwell on the 7-day disabled list retroactive to June 6, 2018. May 18, 2018 Salt Lake Bees activated RHP Parker Bridwell from the 7-day disabled list. April 21, 2018 Salt Lake Bees placed RHP Parker Bridwell on the 7-day disabled list. April 7, 2018 Los Angeles Angels optioned RHP Parker Bridwell to Salt Lake Bees. April 3, 2018 Los Angeles Angels recalled Parker Bridwell from Salt Lake Bees. March 23, 2018 Los Angeles Angels optioned RHP Parker Bridwell to Salt Lake Bees. July 16, 2017 Los Angeles Angels recalled Parker Bridwell from Salt Lake Bees. July 6, 2017 Los Angeles Angels optioned RHP Parker Bridwell to Salt Lake Bees. June 17, 2017 Los Angeles Angels recalled Parker Bridwell from Salt Lake Bees. June 15, 2017 Los Angeles Angels optioned RHP Parker Bridwell to Salt Lake Bees. June 14, 2017 Los Angeles Angels recalled Parker Bridwell from Salt Lake Bees. May 31, 2017 Los Angeles Angels optioned RHP Parker Bridwell to Salt Lake Bees. May 30, 2017 Los Angeles Angels recalled Parker Bridwell from Salt Lake Bees. May 9, 2017 RHP Parker Bridwell assigned to Salt Lake Bees from Mobile BayBears. April 17, 2017 Baltimore Orioles traded RHP Parker Bridwell to Los Angeles Angels for cash. April 17, 2017 Los Angeles Angels optioned RHP Parker Bridwell to Mobile BayBears. April 14, 2017 Baltimore Orioles designated RHP Parker Bridwell for assignment. March 8, 2017 Baltimore Orioles optioned RHP Parker Bridwell to Norfolk Tides. October 26, 2016 RHP Parker Bridwell assigned to Peoria Javelinas. October 5, 2016 Parker Bridwell roster status changed by Baltimore Orioles. October 4, 2016 Baltimore Orioles reassigned RHP Parker Bridwell to the minor leagues. October 3, 2016 Baltimore Orioles recalled RHP Parker Bridwell from Norfolk Tides. August 25, 2016 Baltimore Orioles optioned RHP Parker Bridwell to Norfolk Tides. August 21, 2016 Baltimore Orioles recalled Parker Bridwell from Norfolk Tides. August 15, 2016 RHP Parker Bridwell assigned to Norfolk Tides from Bowie Baysox. July 14, 2016 Bowie Baysox activated RHP Parker Bridwell from the 7-day disabled list. July 9, 2016 Bowie Baysox sent RHP Parker Bridwell on a rehab assignment to Aberdeen IronBirds. June 29, 2016 Bowie Baysox sent RHP Parker Bridwell on a rehab assignment to GCL Orioles. May 26, 2016 Bowie Baysox placed RHP Parker Bridwell on the 7-day disabled list. Left rib injury. March 18, 2016 Baltimore Orioles optioned RHP Parker Bridwell to Bowie Baysox. November 20, 2015 Baltimore Orioles selected the contract of Parker Bridwell from Bowie Baysox. September 23, 2015 Bowie Baysox activated RHP Parker Bridwell from the 7-day disabled list. August 1, 2015 Bowie Baysox placed RHP Parker Bridwell on the 7-day disabled list. April 5, 2015 RHP Parker Bridwell assigned to Bowie Baysox from Frederick Keys. March 6, 2015 RHP Parker Bridwell assigned to Baltimore Orioles. July 9, 2014 RHP Parker Bridwell assigned to Frederick Keys from Aberdeen IronBirds. July 3, 2014 RHP Parker Bridwell assigned to Aberdeen IronBirds from Frederick Keys. March 28, 2014 RHP Parker Bridwell assigned to Frederick Keys from Delmarva Shorebirds. August 15, 2011 RHP Parker Bridwell assigned to Delmarva Shorebirds from Aberdeen IronBirds. June 14, 2011 Parker Bridwell assigned to Aberdeen IronBirds from Delmarva Shorebirds. June 11, 2011 Parker Bridwell assigned to Delmarva Shorebirds from Aberdeen IronBirds. June 5, 2011 Parker Bridwell assigned to Aberdeen IronBirds from Delmarva Shorebirds. June 4, 2011 RHP Parker Bridwell assigned to Delmarva Shorebirds from Aberdeen IronBirds. August 31, 2010 Parker Bridwell assigned to Aberdeen IronBirds from GCL Orioles. August 10, 2010 Parker Bridwell assigned to GCL Orioles from Baltimore Orioles. August 9, 2010 Baltimore Orioles signed RHP Parker Bridwell.